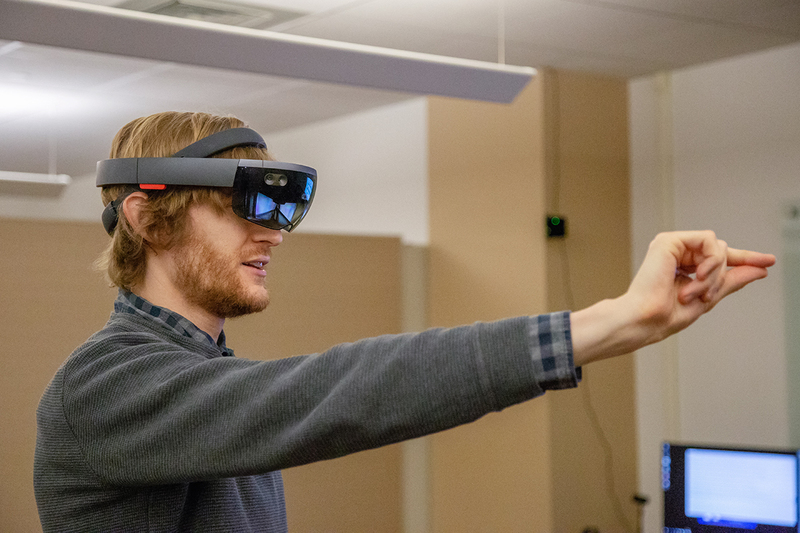 University of Illinois IT technical associate Rob Wallace uses hand gestures to control an augmented-reality headset. CHAMPAIGN, Ill. — The Carle Illinois College of Medicine is seeking submissions for the first Illinois Health Make-a-Thon competition. Anyone who lives in Champaign County can submit an idea for improving human health on the Health Maker Lab website. The deadline for idea submissions is March 11. A panel of experts from the university will review submissions and choose the best ideas that can be addressed by the Health Maker Lab, a network of several maker labs and design spaces across campus. Twenty finalists will pitch their ideas to judges who include professors, physicians and local entrepreneurs at the Health Make-a-Thon event, planned for 6 p.m. on April 13 at the Beckman Institute. Ten winners will receive up to $10,000 each in Health Maker Lab resources to create a real prototype of their idea. The Health Maker Lab is designed to democratize health innovation, said Ruby Mendenhall, the assistant dean for diversity and democratization of health innovation at the Carle Illinois College of Medicine. Organizers will notify competition finalists by March 29. Official competition rules can be found here.